Double-walled tea glasses to celebrate the high art of enjoying tea in absolute perfection. The elegant-stylish “photographer’s choice” among tea cups that asserts every nuance of a tea’s color in the most noble manner. The glass tea cups do not only preserve any tea’s taste in completely unadulterated form, but also ensure that the tea will stay hot for significantly longer periods, while being cool on the fingers holding the tea glass at the same time. 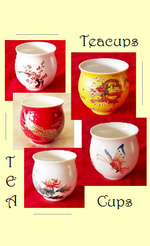 Chinese Teacup Set, 6-piece, porcelain (China bone), double-walled, earless. ‘Golden Phoenix’ 6-piece teacup set, porcelain, double-walled, earless. ‘Red Flowert’ 6-piece teacup set, porcelain, double-walled, earless. ‘Golden Flower’ 6-piece teacup set, porcelain, double-walled, earless.